Why does it say: he prayed with himself? Why not aloud? Because God listens more carefully to what his heart says than his lips. What a man thinks and feels as he prays to God is more important to God than the words his tongue forms. The tongue is capable of delusion, but the heart does not delude: it shows a man as he is – black or white. This entry was posted in Sayings from Saints, Elders, and Fathers, St. Nikolai Velimirovich and tagged Delusion, Drawing to God, Prayer, Publican, Publican and the Pharisee, Speech on February 23, 2016 by ocqadmin. Unseen Warfare: . . . you will have to render a strict account for every minute of this present hour. Refuse to listen to the devil when he whispers to you: give me now, and you will give tomorrow to God. No, no! Spend all the hours of your life in a way pleasing to God; keep in your mind the thought that after the present hour you will not be given another and that you will have to render a strict account for every minute of this present hour. This entry was posted in Sayings from Saints, Elders, and Fathers, St. Nicodemus of the Holy Mountain, St. Theophon the Recluse and tagged Drawing to God, Final Judgement, Forgetting God, Judgement of God, Judgment Day, Pleasing God, Present, The Evil One on September 20, 2015 by ocqadmin. St. John of Shanghai and San Francisco: Until a man’s earthly life finishes its course, up to the very departure of the soul from the body . . .
Until a man’s earthly life finishes its course, up to the very departure of the soul from the body, the struggle between sin and righteousness continues within him. However, high a spiritual and moral state one might achieve, a gradual or even headlong and deep fall into the abyss of sin is always possible. Therefore, communion of the holy Body and Blood of Christ, which strengthens our contact with Him and refreshes us with the living streams of the grace of the Holy Spirit flowing through the Body of the Church, is necessary for everyone. This entry was posted in Sayings from Saints, Elders, and Fathers, St. John of Shanghai and San Francisco and tagged Death, Drawing to God, Eucharist, Falling Away, Falling Down Getting Up, Grace of God, Holy Spirit, Sin, Soul and Body Separating on August 22, 2015 by . The Lord said: Verily I say unto you, Inasmuch as ye have done it unto one of the least of these My brethren, ye have done it unto Me (Matthew 25:40). 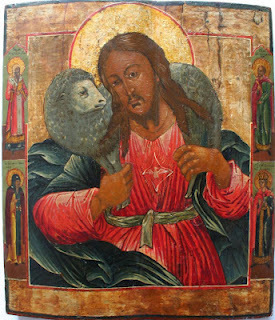 This entry was posted in St. Nikolai Velimirovich and tagged Alms, Begger, Blessings, Charity, Drawing to God, Entertaining Strangers Unawares, Eucharist, Mercy, Poor, Scripture Gospel of Matthew on August 21, 2015 by . 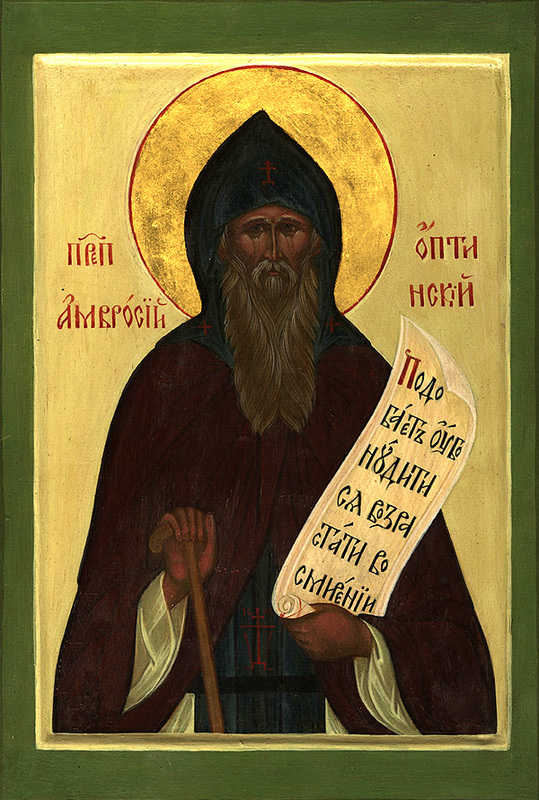 St. Ambrose of Optina: If you do good . . . If you do good, you must do it only for God. For this reason you must pay no attention to the ingratitude of people. Expect a reward not here, but from the Lord in heaven. If you expect it here — it will be in vain and you will endure deprivation. This entry was posted in Sayings from Saints, Elders, and Fathers, St. Ambrose of Optina and tagged Drawing to God, Goodness, Kingdom of Heaven, Living in the World, Material World, Pleasing God, Quotes of the Optina Elders, Reward, Works on August 18, 2015 by . St. Paisios of Mt. Athos: Women usually have no sense of moderation when it comes to household chores. . . .
Women usually have no sense of moderation when it comes to household chores. They’re constantly finding things to do. While they do have a lot of heart and could do much “housecleaning” in their soul, they often waste their heart on insignificant things. Let’s say we have a delicate glass with very intricate designs. Now, if this glass didn’t have all these designs on it, it would still serve its purpose as a glass. But no, women go to the store and start: “No, I want the designs up higher, to this point; no, not this way, the other way…” And if there should be some floral details on it, well then the heart really starts leaping! But by doing this, women lay waste to all their energy and potential. You’ll hardly find a man paying so much attention to such details. For example, a man will hardly notice if a lamp shade is brown or black. But a woman wants something beautiful and she rejoices in it; she gives a port of her heart to this, a part to that, and then what is left for Christ? Only a tired yawn is spared for the time of prayer. The more a woman distances her heart from material things, the closer she comes to Christ. And when her heart is given to Christ, then she acquires great strength. This entry was posted in Sayings from Saints, Elders, and Fathers and tagged Drawing to God, Family, Family Life, Material World, Prayer, Spiritual Life, Strength, Wives, Women, Worldliness on August 16, 2015 by . 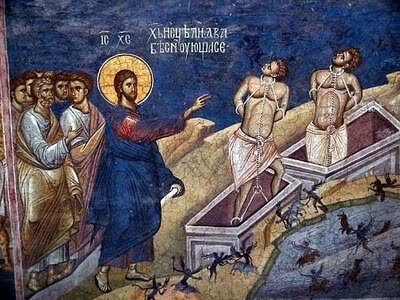 St. Theophan the Recluse: When going to the Holy Mysteries, go with . . . When going to the Holy Mysteries, go with simplicity of heart, in full faith that you will receive the Lord within yourself, and with the proper reverence towards this. What your state of mind should be after this, leave it to the Lord Himself. Many desire ahead of time to receive this or that from Holy Communion, and then, not seeing what they wanted, they are troubled, and even their faith in the power of the Mystery is shaken. The fault lies not with the Mystery, but with superficial assumptions. Do not promise yourself anything. Leave everything to the Lord, asking a single mercy from Him — to strengthen you in every kind of good so that you will be acceptable to Him. The fruit of Communion most often has a taste of sweet peace in the heart; sometimes it brings enlightenment to thought and inspiration to one’s devotion to the Lord; sometimes almost nothing is apparent, but afterward in one’s affairs there is a noted a great strength and steadfastness in the diligence one has promised. This entry was posted in Sayings from Saints, Elders, and Fathers, St. Theophon the Recluse and tagged Drawing to God, Eucharist, Faith, Living Orthodoxy, Logic/Logical Mind & Thinking, Mystery, Peace, Spiritual Tools on August 14, 2015 by . St. Isaac the Syrian: . . . But do not sin, O man, expecting that you will repent . . . This entry was posted in Sayings from Saints, Elders, and Fathers, St. Isaac the Syrian and tagged Confession, Death, Debt, Drawing to God, Forgiveness, Forgiveness of God, God as Judge, Justice, Justice of God, Mercy, Mercy of God, Repentance, Sensual Pleasure, Sin, Vengence of God on July 28, 2015 by .